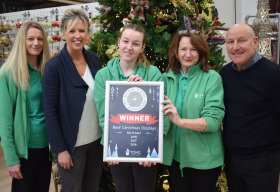 Tong Garden Centre was judged on the range, merchandising, marketing, presentation and displays of Christmas lines including trees, decorations, tableware, candles, giftware and food during the Garden Centre Association's (GCA) inspection for its annual Christmas Competition. Not only did the team at Tong win the accolade for a third consecutive year, but they were awarded a score of 84%. The GCA class a score between 80-90% as excellent to outstanding. Tong's commercial director, Sharon McNair said: "Congratulations to everyone - it's a great result and well deserved. Christmas at Tong really is a massive team effort and every department within the centre has contributed to this success.